Ariana Grande Reveals How Pete Davidson Affected "Thank U, Next"
Ariana Grande almost didn't drop names in "Thank U, Next." In a new interview, the pop star talks about how her and former fiancé Pete Davidson's split impacted the breakup anthem track's lyrics, which include his name as well as those of ex-boyfriends Big Sean, Ricky Alvarez and late rapper Mac Miller. She also hinted that she is not in touch with Pete. "Thank U, Next" was released in November, a month after she and Pete ended their engagement and split following a whirlwind summer romance. Grande had told fans on Twitter that Sean and Ricky heard the song before it was dropped, without elaborating, and said in an interview on the Zach Sang Show, released on Saturday, that Sean and Alvarez both "loved it." "Everyone that I am still in touch with has been very supportive of it," Grande said. It's understandable that Grande and Pete's breakup would affect the lyrics of "Thank U, Next" even minimally; she references their broken engagement. In the first verse, Grande sings, "Thought I'd end up with Sean / But he wasn't a match / Wrote some songs about Ricky / Now I listen and laugh / Even almost got married / And for Pete, I'm so thankful / Wish I could say 'thank you' to Malcolm / 'Cause he was an angel." Grande said in the interview that she had recorded two alternate versions of "Thank U, Next," including one without the names, before deciding to release the single that was dropped. "There's a version where I was getting married, there's a version where I'm not getting married, there's a version with nothing—we're not talking about anything," she continued. "But we all knew that the first version was gonna be the version we ultimately went with." Grande added, while getting emotional, "It was a big risk and a very scary thing to do, because it is my life. I understand that to a lot of people, I'm not a real person, or it's easy to just kind of like see me as like, a song or a picture or like a thing that kind of exists in their head and they know what they know and that's it. But at the end of the day, these are people and relationships. It's real s--t to me. It is real life and I spent a lot of time with each of those people...it was like scary to put in a song." Her and Pete's split was followed by some public drama. 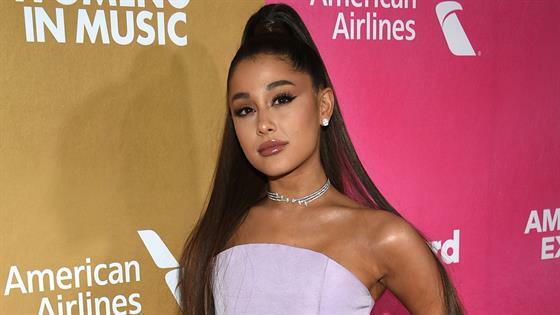 When the SNL star sparked alarm in December by posting a seemingly suicidal note on Instagram and then deleted his account, Grande reached out to him on Twitter and rushed to the show's studios to see him, but he refused to meet her. He has since appeared to recover following his scare and has also moved on in his love life; he has been spotted out with Kate Beckinsale. Earlier this week, Grande appeared to tell TMZ she thinks Pete and Kate are "so cute" together. "I had sent it to Sean and he loved it. He loved it," Grande said. "It was very funny. He was like, 'Damn, I'm the first one, huh?' And I was like, 'I mean, you know, I went kind of in order.' He was very supportive, he loved it." "Ricky loved it," she continued. "He was like, proud. But Ricky was like, 'Why did I get the worst line?' and I was like, 'What do you mean?' He was like, 'Everyone else's line is so nice, and mine is like, 'Man, f--k him, he's trash.' I was like, 'No, I could have said that, I could have said, 'Wrote some songs about Ricky / Never mind, he's trash.' I was like, 'I could've said that.' But I didn't, I said, 'Now I listen and laugh.' 'Cause it didn't work out.'" Sean has not commented publicly about "Thank U, Next." After the single was released, Ricky, who once worked as Grande's backup dancer and dated her from 2015 to 2016, had posted on his Instagram Story a video of him listening to the song and looking perplexed. He later wrote, "Nothing but gratitude [black heart emoji]. Thank u, next. (Those songs are fire tho... you're welcome.)" Grande had previously written the 2016 song "Moonlight" about Ricky. She has also written about Pete before; her previous album Sweetener features a track called "Pete Davidson." Fans also think he and Mac, who died of a drug overdose in September, are referenced not by name on more tracks on Grande's Thank U, Next album.